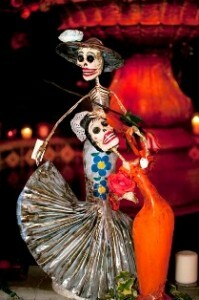 El Portal Sedona Hotel ~ Celebrate Dia de los Muertos or Day of the Dead! For this, the third year of Dia de los Muertos, Tlaquepaque Arts and Crafts Village will be creating a beautiful public mural in the Calle Independencia – the Marigold Mural Project. Visitors and residents alike are invited to paint on the mural as a way to honor the loss of loved ones in their lives and connect with one another though art. The celebration is meant to be a joyful and vibrant event, where death loses its dark and sad nature and becomes cheerful and friendly. Festivities begin Tuesday October 30th and carry through to Saturday November 2nd with the final celebration of Day of the Dead. There are activities and entertainment Friday and Saturday from 4:30 pm to 9:00 pm, including music, fire dancing, strolling mariachi; with virtuoso flamenco guitarist, Eric Miller to wow audiences with traditional Latin music. Tlaquepaque shops and galleries will also be opened until 8:00 pm for First Friday on the 2nd. Call the Village office at 928-282-4838 for more information. El Portal Sedona Hotel is having an “October Remnants” sale on now until the end of the month – perfect timing for joining in the Marigold Mural Project. This may be High Season, but our rooms are being offered at Low Season rates, must be booked online! To stay for the entire festival, we have our “Fall Colors” Sedona hotel special, call 1.800.313.0017 for details. El Portal is located just steps from Tlaquepaque. Close and convenient for all of the festival’s activities and events. We are also a pet friendly Sedona hotel with no pet fees. Celebrate Dia de los Muertos at Tlaquepaque and then return to the serenity of El Portal. Enjoy a glass of wine by the fireplace in the great room, by the camp fire in the courtyard, or in the whirlpool tub in your room. 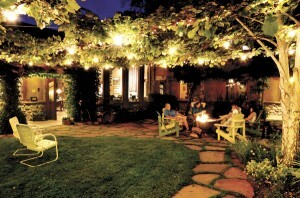 El Portal Sedona Hotel – for unpretentious luxury. Reserve your Sedona hotel room today – call 1.800.313.0017.